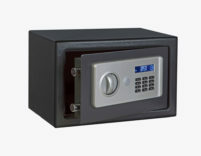 Electronic combination safe with louver. STR Safe is part of the hotel line that guarantees a valid application for hotels, cruise ships and hospitals. The front slit of mm. 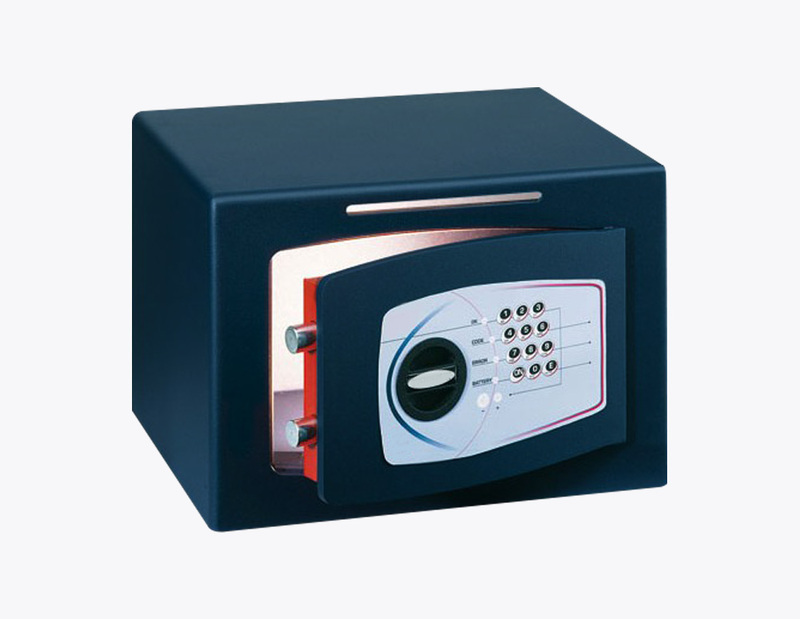 170 x 8, equipped with a slide and anti-repechage protection, allows the introduction of cash, envelopes or small packages, without the need to open the safe. This version proves, therefore, a very effective deterrent against theft and robbery, especially in environments where, despite the considerable amount of money circulating, security measures are scarce. Digital Electronic Combination with Variable Opening Delay from 0 to 99 minutes. 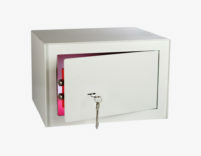 Lock controlled by an electronic device with high reliability, with permanent memory. Opening / closing with control knob and block with electromagnet. Internal power supply from 220 V mains with supplied power supply / transformer, or with 4 1.5 V alkaline batteries (not included). Membrane keyboard with 4 dedicated leds. External battery contacts obtained directly on the keyboard. Sound and visual signals for typing confirmation, errors and internal batteries in the phase of exhaustion. Nickel-plated steel bolts, rotating, Ø 22 mm. Protection to the lock mechanism with manganese steel plate. Upper horizontal and vertical bolts protected by a 3 mm thick manganese steel plate, positioned obliquely in order to obtain maximum drill resistance. Special jokes of the door to resist the attempts to break in with a hammer for longer. Robust internal welds made with a robotic system. Monobloc body welded and ground with robotic automated systems. Anchorage holes on the base and on the back, supplied fixing plugs. Thermosetting powder coating with oven drying. 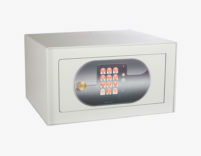 Electronic combination safe Safe for hotel HDE with frame and door in steel 6 mm laser cut, external wall 2.5 mm. 3 holes in the back and 2 in the base to facilitate the fixing in the furniture or anchorage with wall plugs. Available in RAL 9002 white color.